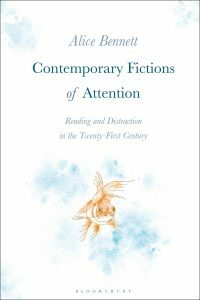 Alice Bennett answered a few questions for us about her new book Contemporary Fictions of Attention: Reading and Distraction in the Twenty-First Century. Contemporary Fictions of Attention is a book about how twenty-first-century writing has responded to the idea that reading books should improve concentration that has been damaged by digital distractions. I had read a lot of newspaper think-pieces from authors complaining that the internet had made their readers too inattentive to appreciate their books properly, and ended up collecting a lot of examples of this genre of article. At the same time, I noticed authors (those I wrote about in the book: Joshua Cohen, Ben Lerner, Tom McCarthy, Ali Smith, Zadie Smith, David Foster Wallace) whose work seemed to be offering a much more complicated picture of contemporary attention. The book is a way of reconciling a relatively consistent public discourse of collective anxiety about distraction with a much more wide-ranging and less coherent story about contemporary attention that emerges through fiction itself. I’ve been working on these ideas for nearly six years now. The project began with an interest in boredom. I’d just written a book about literature and life after death (Afterlife and Narrative in Contemporary Fiction, Palgrave 2012) and boredom was a minor but significant part of how I understood eternity in that work. The project came together when I realized that I needed to think about attention to understand boredom. In the fiction I look at in the book, attention is a way of talking about all sorts of things: self-improvement and wellbeing, procrastination and presenteeism, emotional labour and affect, absent-mindedness, temporality, the everyday, love and desire, ethics, carefulness and caring, and debates about the aesthetic value of different kinds of attention, from rapt immersion to piercing critical focus. Attention is a concept that connects all kinds of things about contemporary culture that might, on the face of it, seem completely separate. What are the five things a reader should look up in your book’s index? I love everything about the Object Lessons series, but especially their satisfyingly offbeat attention to everyday things. My favourites so far are Joanna Walsh’s Hotel and Michael Marder’s Dust. Alice Bennett is senior lecturer in English Literature at Liverpool Hope University, UK. She has published on contemporary fiction in Critique, the Oxford Literary Review, and Textual Practice and is the author of Afterlife and Narrative in Contemporary Fiction (2012). Her new book, Contemporary Fictions of Attention, is now available from Bloomsbury.